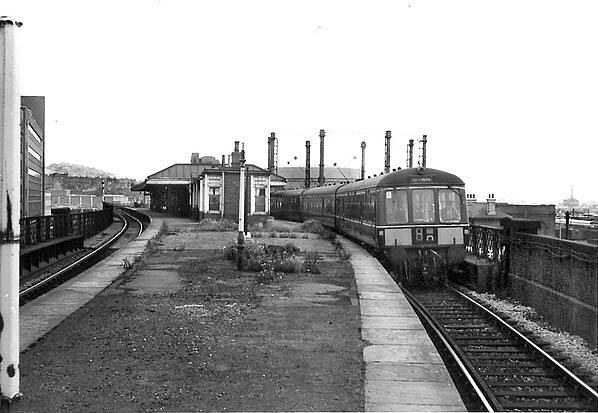 The 12.45 service from Grantham is seen leaving the High Level station on 3 January 1965 shunting forward to Weekday Cross to cross over to the up line for the return journey to Grantham. 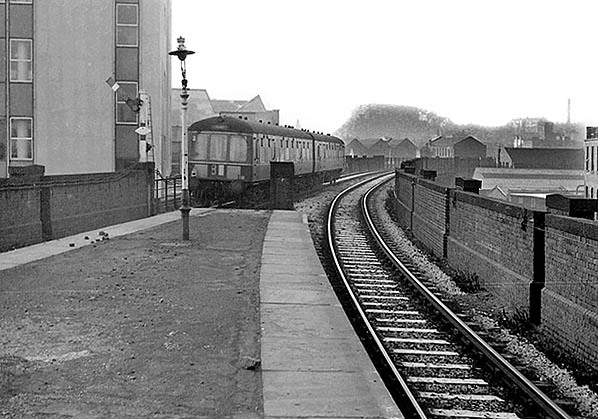 station on 3 January 1965. 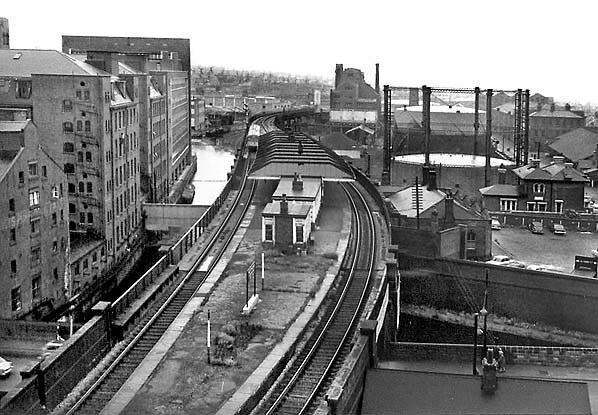 Another elevated view of Nottingham London Road High Level station looking east in June 1967. London Road is seen in the foreground and, beyond that, the Nottingham Canal. 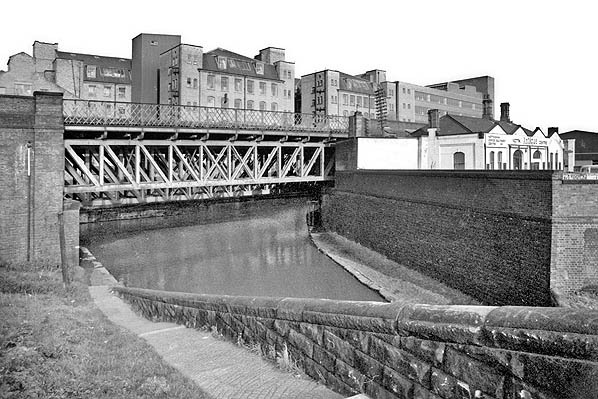 The Poplar branch of the canal is seen on the left running between the High Level line and Boots the Chemist's factory. 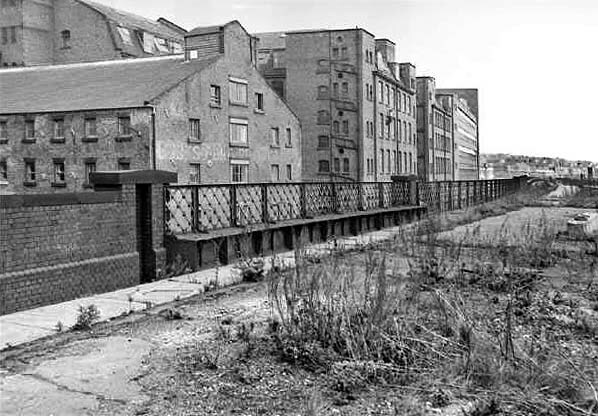 In the distance the Great Northern corn warehouse is seen top right and, in front of it, the LNWR's goods warehouse. Photo from John Mann collection. With a few weeks to go before closure, another class 114 DMU from Grantham awaits departure from the High Level station before proceeding into Victoria. Looking north along London Road on a wet day in January 1969 as a Level Class 45 goods service from East Leake passes through the closed High Level station. 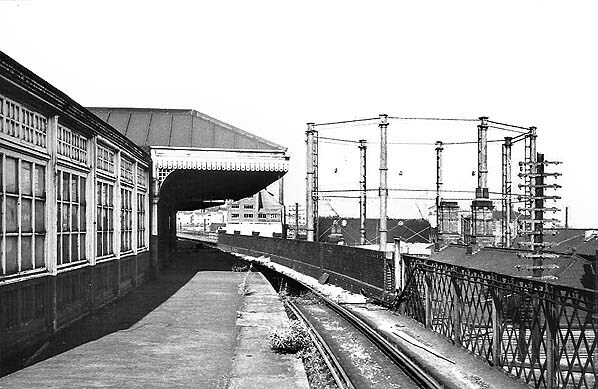 Nottingham London Road High Level station looking east along the up platform face in 1969, two years after closure. Little has changed apart from the removal of the station signs. The track appears rusty although it was still in use for freight traffic at this time. 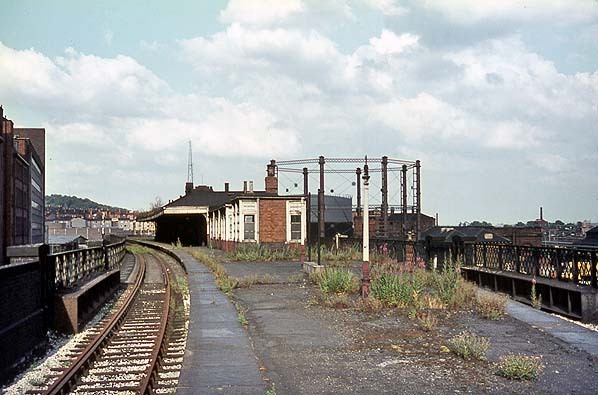 Nottingham London Road High Level station looking east along the down platform face in 1969, two years after closure. 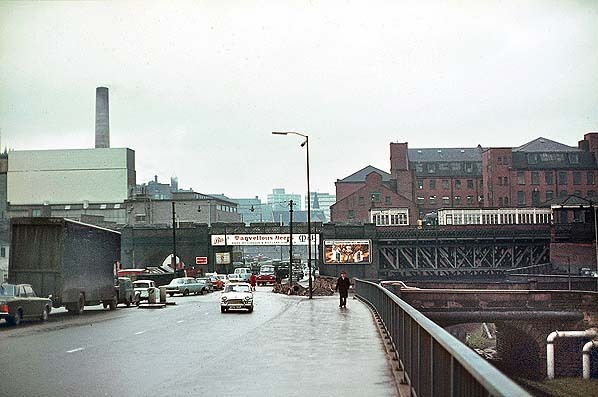 Nottingham London Road High Level Station looking west towards Victoria in March 1973 after demolition of the track level buildings. The down track is clearly still well used but the up track appears rusty and out of use. Class 25 5213 is seen propelling a freight train from Colwick to East Leake in May 1973. 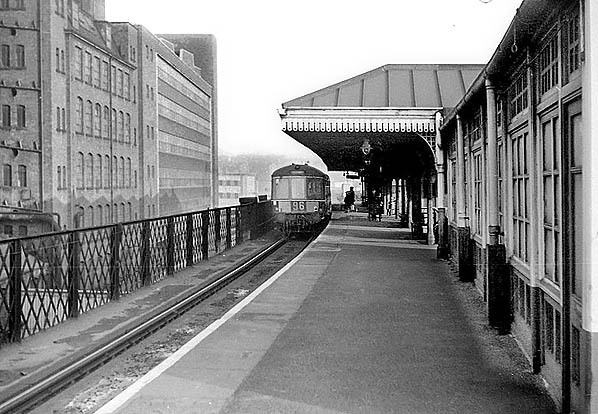 Looking east along the disused platform at the High Level station in April 1975. 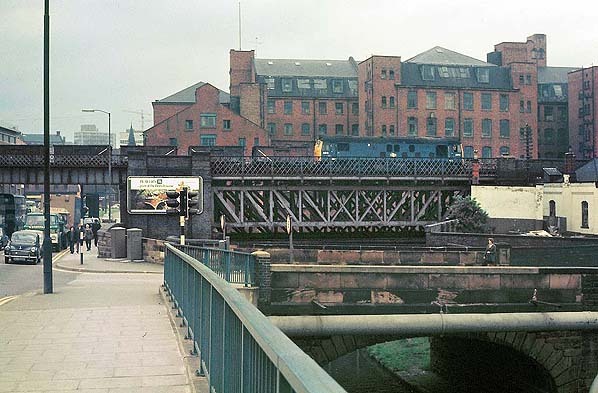 The viaduct over the Nottingham Canal in December 1980. The street level building had found a new lease of life as an antique shop by this time. Looking east along the Poplar arm of the Nottingham Canal in December 1980. 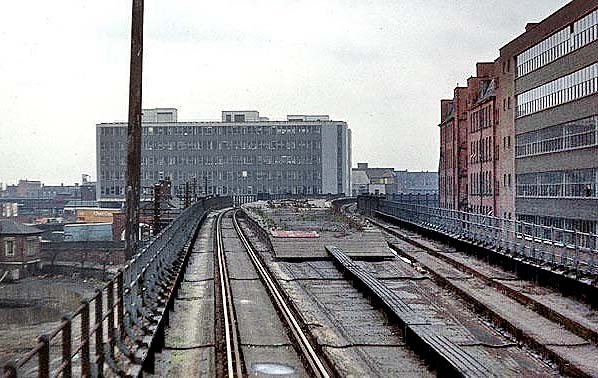 The High Level station is on the right with the platform on top of the viaduct. The Boots the Chemist's factory is on the left. 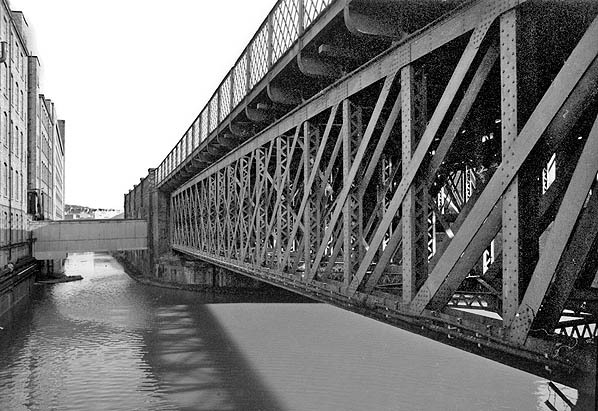 The main line of the Nottingham Canal makes a right angle turn under the bridge at this point.